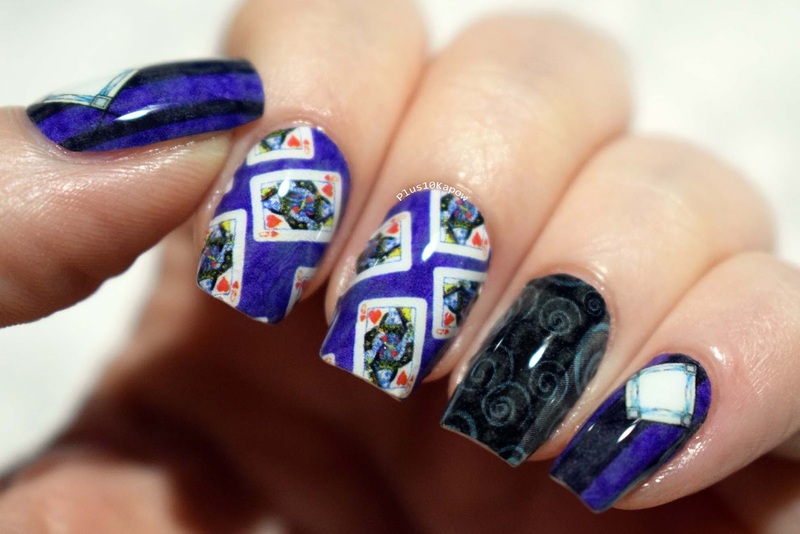 These Espionage Cosmetics Mad Moxxi nail wraps were from the Loot4Fangirls Loot Crate, yes, I know, that was bloody ages ago but I was saving these for a time when I knew I wouldn't be doing my nails for a while, so I could fully test them on wear. So when I got the signs that I would be hermiting away for a while, I finally gave them a go. 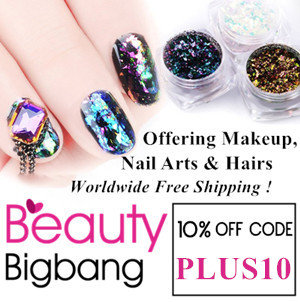 Application was fairly easy and I only had to cut down a couple of wraps to fit my nail, so the sizing of them is pretty spot on for me.My nails are pretty long at the moment and there was a lot of excess so those with long nails can get in on the action too. I applied one coat of Seche once I was sure it was mostly all stuck, then as the Seche was drying, I used a dotting tool to push down and little bits around the edges that had popped up. Just to be safe, I used another coat of Seche on top. These also glow in the dark and to my surprise, they are really bright. This isn't my best glow in the dark photo ever, you can barely see what it is but at least you can see it's bright. 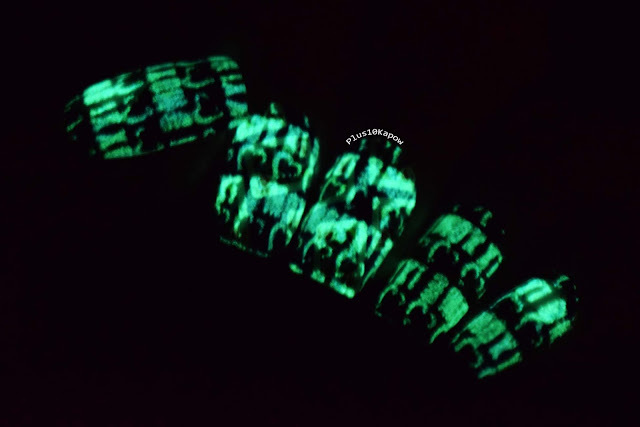 These wraps lasted me 5 days during hermit time! 5 Days! That's like a new record for me. On the fifth day, the cuticle end did start to snag on my hair but I think that was more the Seche, so if you want to extend wear time, you could go round the top with a brush dipped in polish remover and then add a new coat of topcoat. Removal was easy, you just push something up under one edge and peel off. The peeling was quite tough and their adhesive is pretty sturdy stuff, so I honestly worried that it was going to damage my nail, but there was no damage at all. I wiped my nail over with a bit of polish remover to get rid of any residue and bosh, done! I've never been amazing with nail wraps, my fingers are too derpy, my nails are too curved and it takes me ages to do it. I've had a few occasions where it went really well and I definitely think the quality of the wraps have something to do with , I am starting to really like them. 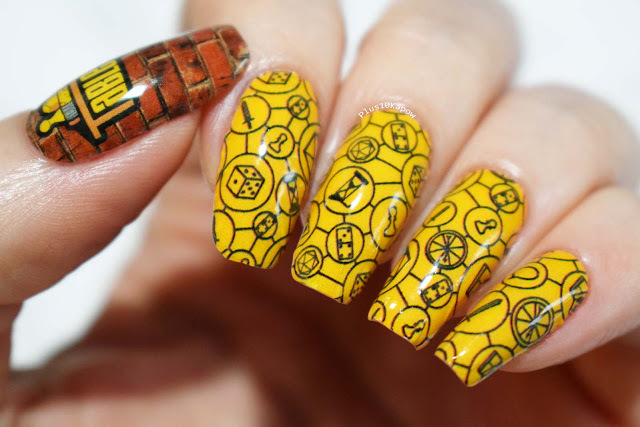 I mean, it's a great way to get some awesome nail art without the extra effort and I imagine that the more you use them, the better you get at applying them. 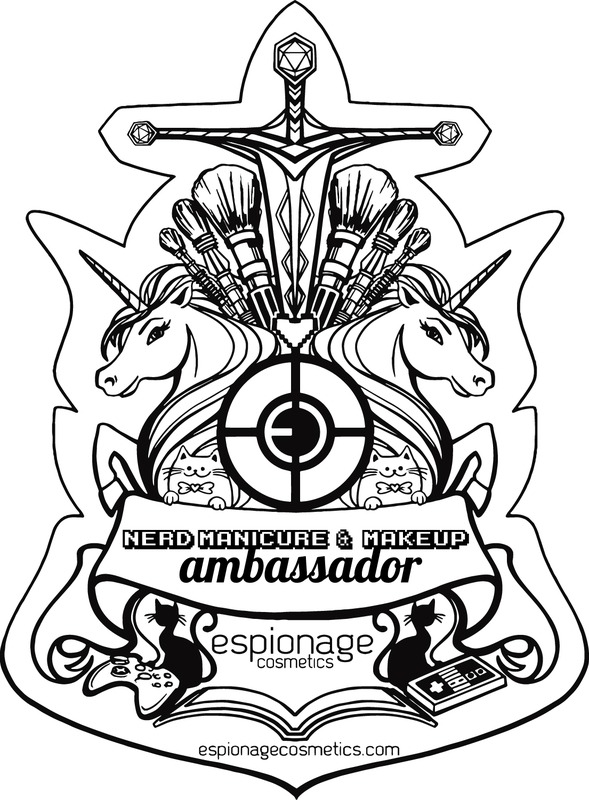 I am so glad that my experience with these wraps went well, because, and this is kind of an announcement and I am very excited about it, I am now a Nerd Makeup Ambassador for Espionage Cosmetics!!! How friggin awesome is that? When I was contacted about it, all my squee literally fell out and I've been so excited ever since. 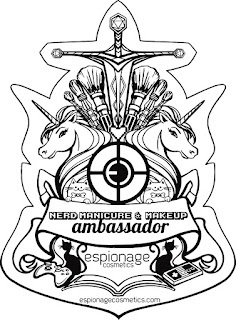 All their products are awesomely nerdy and I have been lusting after them for so long. This is the most exciting thing to happen in so long, I'm probably going to survive on this squee high for a while. 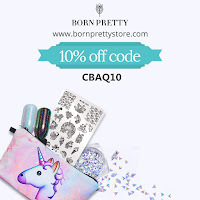 So keep an eye out for lots of nail wraps in the future. 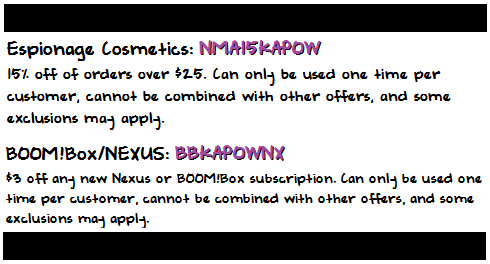 I also have these awesome discounts to offer you, to share the love with you my beautiful weirdos. You can use NMA15KAPOW to get 15% off orders over $25 or you can get $3 off any new Nexus or BOOM!Box subscription by using code BBKAPOWNX. Please read the conditions for the codes and click the codes to be taken over to the right place. They ship to loads of places but please do factor into your budget the customs charges for your country. For the UK, you will be charged customs on any purchase over £15 and at the moment, with how crap the exchange rate is, it's very easy to hit that amount. What nerdy wraps are you looking forward to seeing on here? which ones are you planning on buying?